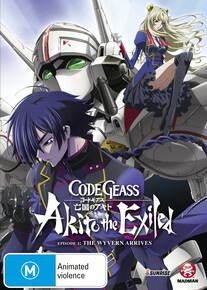 The side story takes place in 2017 a.t.b., around the time Lelouch took on the alter-ego “Zero” and built up his “Black Knights” rebellion army. The setting is in Europe, where the Euro Universe (E.U.) allied nations are being invaded by the overwhelming forces of the Holy Britannian Empire. On the verge of defeat, the E.U. army forms a special division known as “W-O″, of which a young pilot named Akito Hyuuga is a member. Layla Malkal, a former Britannian Aristocrat comes to the E.U. 's aid, commanding the “Wyvern” Knightmare corps comprised of Japanese teenagers. They recklessly plunge into a battlefield, where the survival rate is extremely low, at about 5% only. They fight for their freedom, and for a "home" to which they can return.